Backward scheduling is a technique to calculate the project plan from the due date. You can assign the work packages in a way that the entire project will be finished exactly to the due date. In the backward scheduling, a new planning element starts as late as possible. This planning element, which is the last one in the planning chain, stays at the end of the project plan. The idea of the backward scheduling is to determine the latest possible end date of this planning element to meet the planned due date. The latest end and start date of each planning element in the project plan is consequently calculated. Therefore, the project plan is calculated until the latest possible date of the planning start by considering any necessary lags between planning elements. The slacks, critical planning elements as well as the critical path can be determined due to this calculation. For more information on the critical path and slacks, see Show the critical path. On the Edit tab, in the Settings group, click Direction. Select Backward Scheduling from the drop-down list. Enter an end date for the planning. 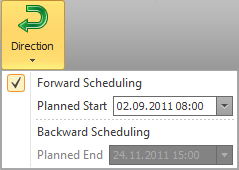 Choose the date in the Planned End box. InLoox PM calculates the project plan from the end date until the start date. Create the first planning element by clicking New Activity or New Milestone in the Edit group, on the Edit tab. This first element is the last one in the project plan and has no successor. Determine the latest completion date of each predecessor in the planning. For more information on how to create planning elements, see Create and edit an activity and Create and edit a milestone. How to plan projects with the backward scheduling feature | InLoox PM 7 • Copyright 1999-2019 © InLoox, Inc. All rights reserved.